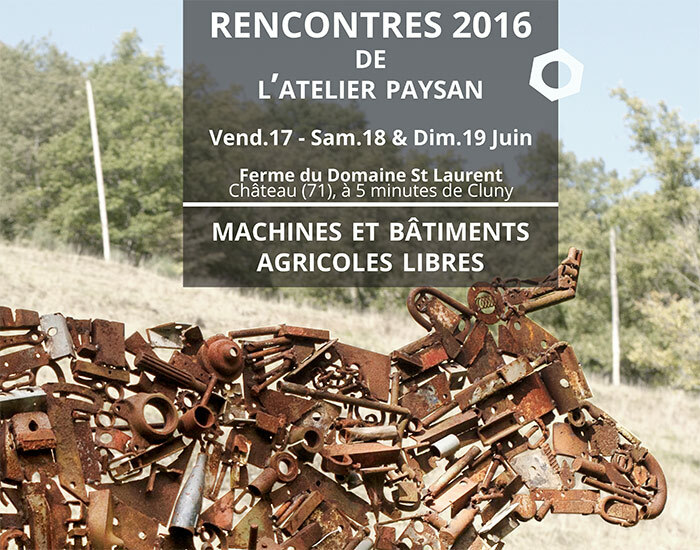 We are a French-speaking collective of small-scale farmers, employees and agricultural development organisations, gathered together as a cooperative named l’Atelier Paysan. Based on the principle that farmers are themselves innovators, we have been collaboratively developing methods and practices to reclaim farming skills and achieve self-sufficiency in relation to the tools and machinery used in organic farming. In 2011, we set ourselves up as a staffed organisation working to promote farm-based inventions, collectively develop new technological solutions adapted to small-scale farming, and make these skills and ideas widely available through courses and educational materials. Since 2015, we have also been offering resources and guidance to farmer-driven projects involving the building or renovation of agricultural buildings. We are based in the Rhône-Alpes region of south east France and also have a branch in Brittany. We have three trucks equipped with the machinery and materials we need to run practical training courses on farms and workshops across France. We provide advice and guidance for small-scale farmers on agricultural tools tailored to their needs, and accompany them through their trials and tribulations in their farming journey, individually or collectively, whatever their area of production. The development of tools and self-built machinery adapted to small-scale farming is a technological, economic and cultural instrument which has been little explored within agricultural development in France, although it can provide a significant impact on the growth of organic farming and contribute to improving organic farming practices. In France, technological practices in agriculture are mainly driven by the agro-industry, and correspond to its particular needs. This complex process is likely to continue, until farmers using these technological practices which are not tailored to their real needs, reassert ownership of the system-wide design of their farms. We know that small-scale farmers are well placed to provide appropriate solutions to the challenges within agricultural development . What’s more, in groups and networks, or with the support of a technical advisor, farmers can collectively develop solutions which are adapted to their own needs. We believe that technological practices need to be made with/ by/ for farmers, and that technology needs to be collectively reclaimed to serve those who use it. We recognise the importance of social and technical farmer networks, both for production and knowledge-sharing. 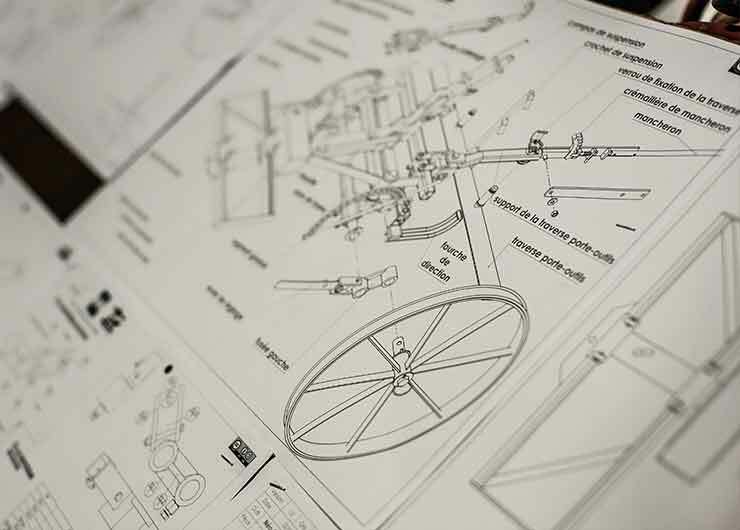 We identify and document inventions and adaptations of tools, created by farmers who have not waited for ready-made solutions from experts or the industry, but have invented or tweaked their own machinery. We seek to promote these farmer-driven innovations. Our internet forum, which acts like a collective sketch-book, is designed to make these contributions visible and accessible. Farmer-led initiatives are gathered by our team and compiled into technical factsheets with photos, videos and testimonies documenting the tools and infrastructure developed by farmers. More than 500 technical factsheets have already been compiled. We are also equipped to support and assist working groups who wish to develop tools adapted to their agricultural practices. Together, we compile a specification sheet for the tool we want to create. Our paid staff produce a draft design which is then corrected by the working group. After a number of feedback and responses, we begin prototyping. Depending on the tool, prototyping can involve a training course where the group can learn or build on their metal working skills. The prototype is then tested on farms and continue developing the design of the tool. Once the group has reached a consensus on the final design, Atelier Paysan can produce an open source design and begin to disseminate the tool through workshops and training courses. Atelier Paysan has a team of three mechanical engineers, led by former market gardener and keen creator Joseph Templier, now joint manager of the cooperative. This team can facilitate sessions with farmers and, employing their engineering skills and the use of computer aided programmes, they can suggest designs based on specifications developed by a working group (Atelier Paysan uses Solidworks software programme). This expertise is essential in order to develop designs which can be replicated by anyone, using only metal bars and standard parts available in any hardware store as raw materials. All the agricultural tools developed by Atelier Paysan and disseminated through our website and training courses have been collectively designed, and respond to a real need felt by the farmers we work with. Within the cooperative we do not make use of our engineering resources to provide technical assistance to individuals, or for the development of tools which are not widely recognised within our network as needed.  The farmers are directly involved in the decision-making processes of Atelier Paysan and thus to have a say in the direction the cooperative takes. This ensures there is critical feedback on the technologies we develop and promote. This includes technologies which could conflict with our ethical principles. We regularly have debates, for example, on the question of working with groups who want to develop drone-powered or automated weeding systems! The technologies and practices we have developed through farmer-led research and development are freely accessible through articles, designs and tutorials, on our website or in our Self-build guide, a 250 manuscript documenting 16 tools adapted to organic farming. We would like to create an open source Encyclopedia, where people can freely contribute and make use of resources available. We believe that farming skills are common goods, which should be freely disseminated and adapted. All our paper and digital publications are available under a Creative Commons license. This license allows anyone to make use of our designs, to photocopy, distribute or modify them, as long as the user mentions their origins, and ensures the modified tool is also licensed under Creative Commons. We provide training courses for farmers to learn to make their own tools. In the course of 3 to 5 days, agricultural tools are created in the workshop which are either non-existent on the marketplace, too costly or not adapted to small-scale organic farming. 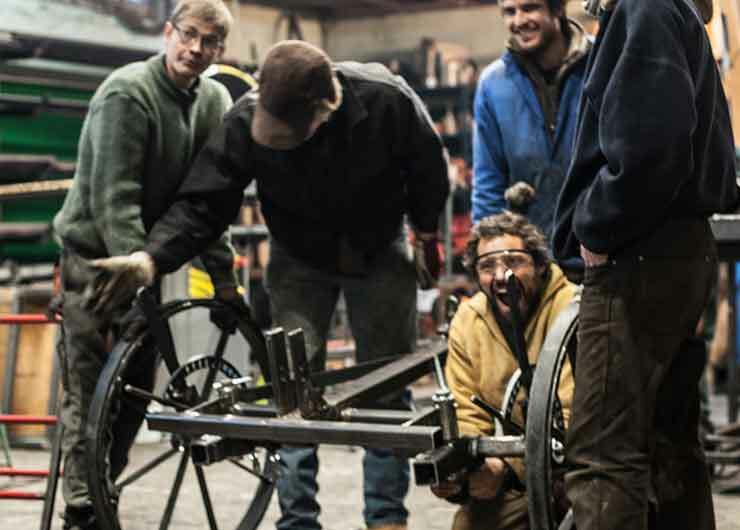 As well as building a tool, farmers gain in autonomy as they learn metal work. A farmer who has built rather than bought his/her tool is better placed to repair or adapt it in future. 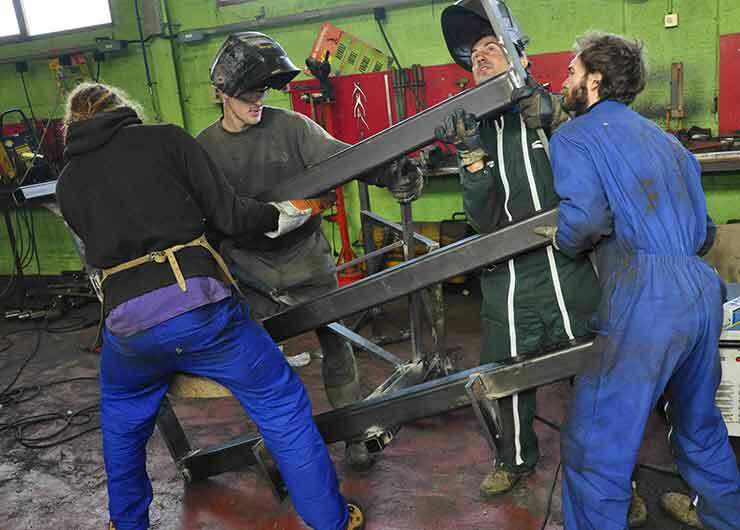 We rent workshop spaces across France where we organise training courses in response to the needs that have been voiced in that local area. 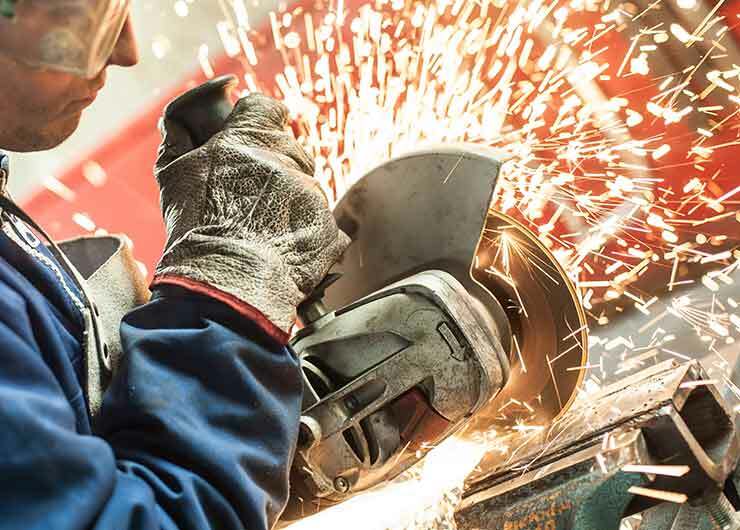 Every participant in the course, whatever their level of expertise, is involved in the different stages of the tool’s creation, from drilling to cutting and welding. At the end of the course, those who wish to can pay for the costs of the raw materials and leave with a finished tool that they can go on to use on their holdings. Our training courses promote tools which are adapted to organic vegetable production, including for example cultivation and weeding tools for permanent bed systems. We also lead on-farm workshops to convert three point linkage machinery to the quick hitch system we have developed. 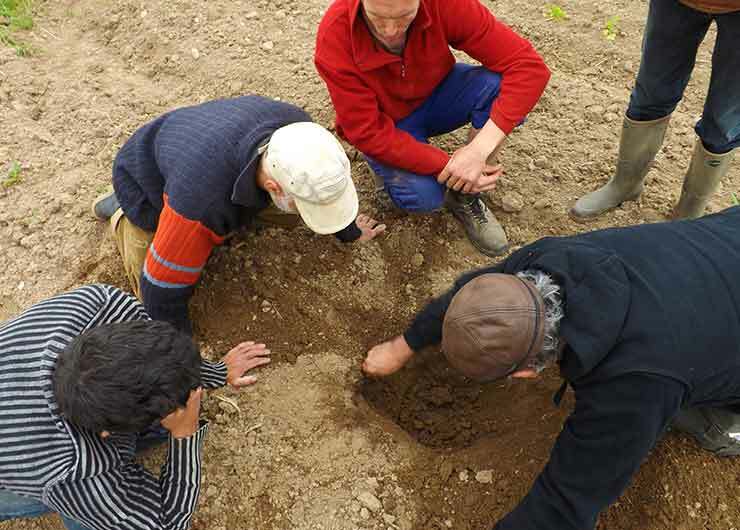 In these workshops, farmers are invited to call on friends and neighbours to join in and help. These workshops are social occasions and an example of the network’s ability to decentralise its activities. Atelier Paysan organises bulk orders for parts and materials, as a way of facilitating access to the machinery that small-scale farmers need. The orders are usually made within training sessions but are also available for farmers wishing to set up their own workshop on their holdings (offering low prices for essential tools such as welding machines, drills, grinders, etc). We also offer quick hitch systems for tractor machinery manufactured at a low cost to encourage farmers to use this safer and more efficient practice of hitching implements onto their tractor. The tools developed by Atelier Paysan are not aimed to be perfect or definitive products. Even though they have been collectively designed, farmers need to assess how they can be best used and adapted on their own holdings. With the training they have received, farmers can go back to their farms and modify their tools, adapting them to suit the context in which they are used. “Visiting farms, we’ve seen to what extent vegetable growers are failing to make use of a wonderful tool: the hand fork. Machinery developed for permanent beds are great tools, but all tools can do a terrible or fantastic job depending on the way they are used. With soil cultivation tools, because the result of your work is buried several centimetres in the soil, it isn’t visible to the naked eye so it’s essential to get out a hand fork and see the impact the tool has had on the soil. We have witnessed how the development of farmer-driven technologies and workshops allow farmers to gain skills and confidence, and engage in discussion on appropriate farm machinery. Both these skills and discussions can help farmers to find the solutions that are best suited to their particular needs. Born out of an activist network of organic farmers in the Rhone Alpes region, our work on self-built technologies adapted for small-scale farming were first developed between 2009 and 2014, through the establishment of a not-for-profit organisation called ADABio Autoconstruction. In 2013, those involved in the organisation felt its legal structure needed developing and wanted to test out a cooperative model. As a company, it would be easier for us to get loans from the banks or social investment networks, which could go to support farmers in their self-build projects, or raising funds for the trucks and machinery required to lead workshops for example. It was also a means of professionalising the management of our organisation, previously administered by volunteers. In France, the legal structure of a cooperatives means users, employees and partners can work together within one company, and is known as Société Coopérative d’Intérêt Collectif or SCIC (similar to the Community Interest Company in UK). In 2015, the cooperative was 50 member strong and included employees, farmers and agricultural development partners. Our legal structure has allowed us to formalise a network of actors working towards the same goal.